Originally designed primarily for land-based casinos, and responsible for some major progressive jackpot wins of late - just check out any one of a slew of YouTube clips - Ainsworth's online version of their Roaming Reels slot retains much of the excitement of its chunky bricks 'n' mortar cousin. A generous 5 reel, 50 pay-line slot, Roaming Reels pretty much does what it says on the tin, as this game is all about the symbols. 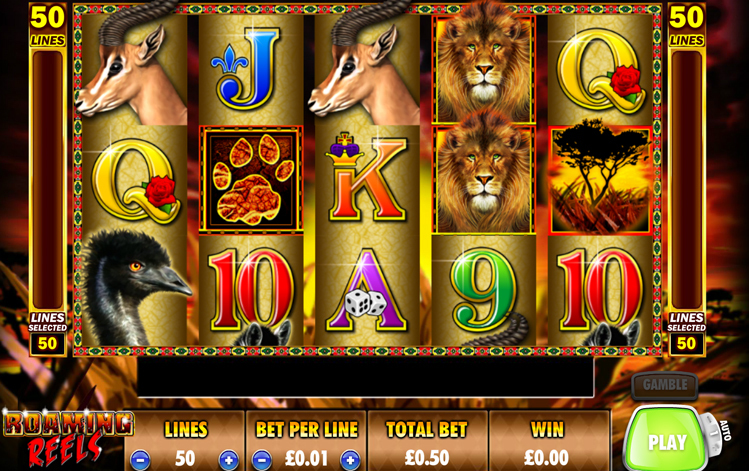 Set in the African Savannah - a popular theme in online slots if ever there was one - our reels here are filled with lions, zebras, emus, gazelles, and the familiar 9-through-Ace symbols. 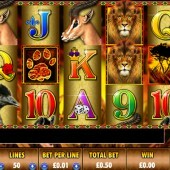 The title page's fearsome lion, as always it seems in these safari-themed slots, is the Wild, appearing on reels 3, 4, and 5. He substitutes for all symbols other than the scatter tree symbol. Get three or more of those tree symbols anywhere across the reels, and you'll activate the free spins bonus game. Three trees get you eight free games, four trees 12 free games, and five trees a very nice 20 free games. This is where a 'lion's paw' symbol comes into play. Land three of those symbols during the free games and you'll get a 10x win on your stake. What's more, the games can be re-triggered at any time. The slot might be a bit light on features, but with plenty of pay-lines, and some stacked symbols doing the rounds during play, you could potentially win big and often in Roaming Reels. Better still, betting starts at just a measly $0.01. If you're in the mood for another safari sojourn, this time with some even better graphics and bonuses, be sure to make a blunderbuss for Betsoft Gaming's African-themed slot, Safari Sam, or the majestic sweep (can slots majestically sweep?) of Cryptologic's lion-filled slot, Savannah Sunrise.